The other day I had an idea for a practical joke, which was to find a place that does low-run quantities of business cards, and have one for every possible activity I might say that I do professionally (publisher, medieval prognosticator, artist, poet, musician, photographer, astrologer, writer, reporter, consultant, dog nibbler, naughty boy, and so on). Then when it's time to do the 'give the person my card' thing I would hand them a stack of cards and ask them what they want me to be as they pick through my various occupations. I don't want to decide -- you decide! I'm curious what you think. How far will technology push us? I am exploring this concept in Vision Quest, the 2016 annual edition of Planet Waves. 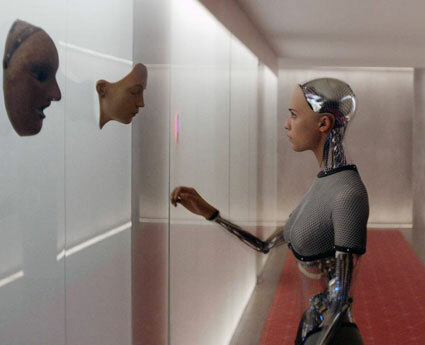 Scene above is from Ex Machina. Here is a written review and analysis. We're not living in the old days, when you were simply a mechanic or pattern maker or tire salesman and that was it. Till recently, a person could be punished by society for mastering two arts -- not taken seriously in either field, called 'jack of all trades', and so on. As with many other forms of monoculture, it was mandatory to choose. Now, many people carry around a few different business cards. It's essential, as the concept of a job is disappearing and it's becoming increasingly necessary to be self-employed. The internet has pushed this into hyperdrive. Yet the identity crisis we live with goes much deeper than one's concept of their true work. There are many competing forces that want to define you as them -- potentially among them, Apple, Google, Subaru, the Catholics, the Democrats, your family, your partner. The way I read astrology, Eris (representing discord, faceting, fragmentation, among other things) in Aries (self-concept, name, identity) tells this story. This transit has been going on since 1925 and it's not over any time soon. Combined with many other factors (such as psychology), the question "who are you?" has never been more difficult to answer. Uranus conjunct Eris in Aries, which spans all of 2016 and 2017, is either going to push this phenomenon off the charts, or precipitate a series of breakthroughs. Astrology does different things for different people -- my purpose is to guide you to the new dimension where you get the full force of this aspect as self-inventive. This aspect could bifurcate -- that is, split consciousness -- along another facet. To one side, it will push the glamor of technology factor that is sucking a lot of souls into the 3G network. It's hard for anyone except for a mind like the late Isaac Asimov (a master of sci-fi and robotics) to imagine how this could go any further, but that's not new. The other side of that equation is its opposite -- a revolution of self-awareness. A movement toward personhood. A full integration of the Aries concept from its roots as the god of war to its destination of self-mastery. It's high time, isn't it? Consider how much toxic aggression comes from the lack of basic self-awareness. The moment it stops being conformist and attention-seeking, Uranus conjunct Eris becomes a profound force for individuation. Part of the revolt is against previous self-concepts. Part of the revolt is against the group that you previously used to define yourself. Will this work for everyone? 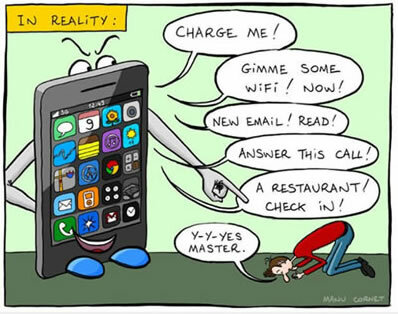 Not exactly -- there will always be people who seek spiritual evolution by upgrading their phone. But there will be some, a self-selected few -- quite possibly including yourself -- who experience a true breakthrough of self. And helping you making this choice is, indeed, the purpose of Vision Quest. PS -- This letter is the latest in a series of astrological missives on the astrology of 2016, connected the Planet Waves annual edition Vision Quest. You can read the prior letter here or pre-order all 12 signs here.